SpyX MukikiM Micro Gear Set - 4 Must-Have Spy Tools Attached to an Adjustable Belt. Jr Spy Fan Favorite & 2015 Product of the Year. Perfect addition for your spy gear collection! 2015 Award Winner from Creative Child Magazine for Product of the Year! 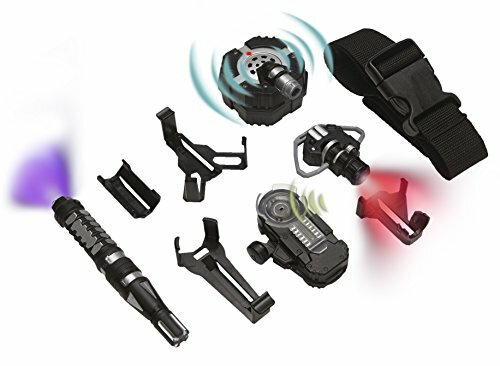 Set Includes Micro Ear Light, Invisible Ink Pen, Micro Motion Alarm, Micro Listener, and an adjustable utility belt with attached clips to carry your spy toys so you're ready to spy at any time! Includes adjustable utility belt with attached clips to carry your spy toys so you're ready to spy at any time! Set includes the Micro Ear Light, Invisible Ink Pen, Micro Motion Alarm, and the Micro Listener. With this bundle your junior agent will be able to see in the dark, read & write secret messages, protect their lair, and listen to secret conversations from afar!